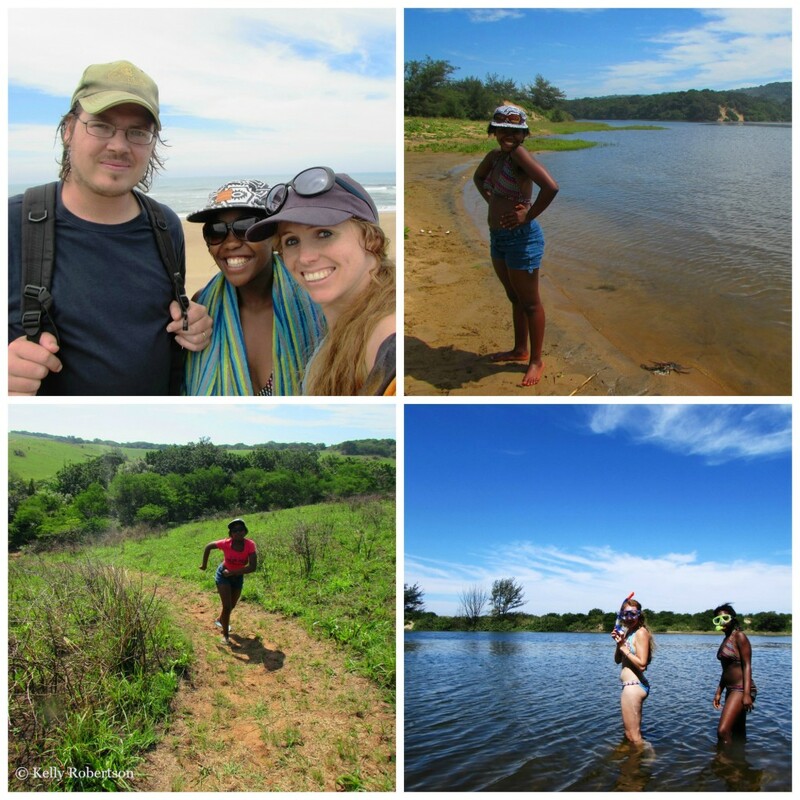 Three activities made up our day’s outing at one of KwaZulu Natal’s most naturally splendid nature reserves. We canoed, swam in the sea and bush walked. It was our kind of triathlon. It was incredible experiencing my first taste of Amatikulu with the pair of them by my side. Violet’s wide-eyed wonderment and willingness to try out every option we were faced with during the day was so fulfilling to watch and Graham’s quiet appreciation of all our little discoveries along the way always makes my heart happy. We navigated a steep, bumpy dirt road down to the picnic site which we weren’t convinced my little car could manage and celebrated once we made it through with 4×4 driving skill. We scrutinized little buck footprints found on the sand dunes on the beach and identified all the water birds we passed on the canoes, pointing out any new sightings to each other with glee. We splashed out of the boats with goggles and snorkels in place to see if we could spot any of the river fish we had seen jumping out the water and trudged up a hill in the heat of the day, eyes in lookout mode for any animals and giggling about who was huffing and puffing the most. I was in my happy place state of mind in the most glorious setting. 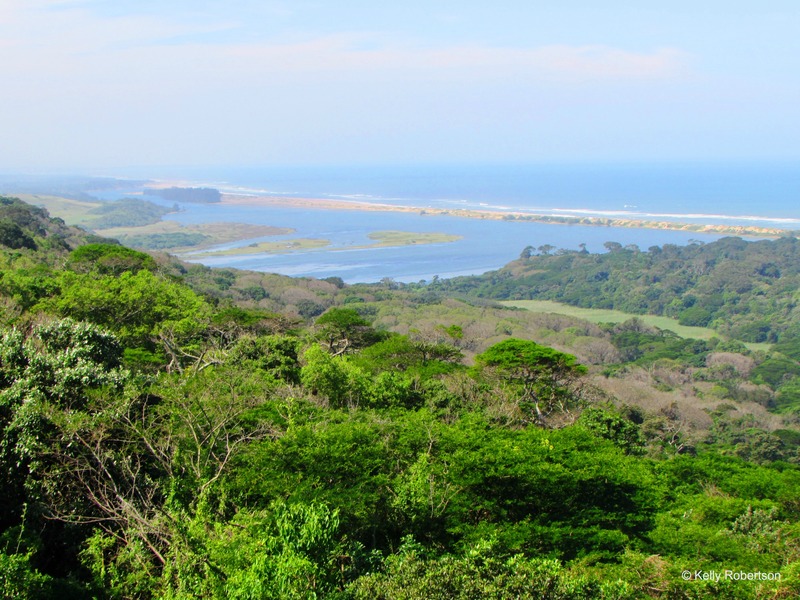 The reserve chills out with its striking views for company about 100 kms from Durban and is set between the Tugela and Amatikulu River mouths. 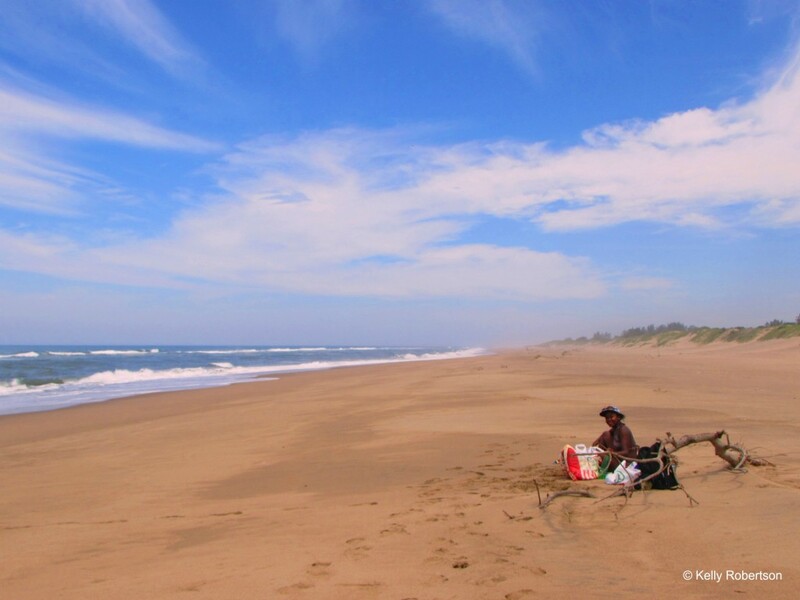 It offers a beautifully, unpretentious and quiet bush and beach experience in one. This is very rare and magical thing. 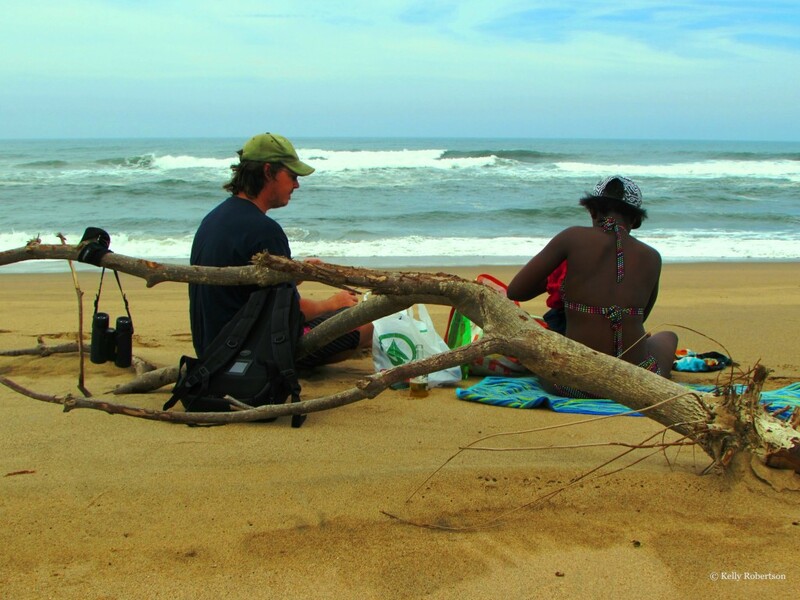 We found ourselves whale watching over the ocean between swims the one moment and ducking through branched gullies on a forest walk amongst the bush birds and zebras in the next. Apart from the walking trails, canoeing and secluded beach time we experienced, visitors can also head out along the 4×4 route. We missed out on this as we weren’t in a suitable vehicle for it this time. We hear it’s an enjoyable driving route and a great way to increase your chances of seeing more wildlife than you might see on foot. The reserve is home to giraffe, kudu, zebra, many little antelope and an impressive array of birdlife. Their constant song accompanied us as we moved through all sections of the reserve. We joked amongst ourselves that we had created our own kind of laid back triathlon day. Our events were: canoeing, swimming in the sea beside untouched beaches and walking a nature trail in the coastal forest. That’s our kind of triathlon. No medals. No stop watches. Just enjoying the great outdoors. We met Junior Gabela at the river’s edge picnic site. He’s a community guide and hires out the canoes to visitors. 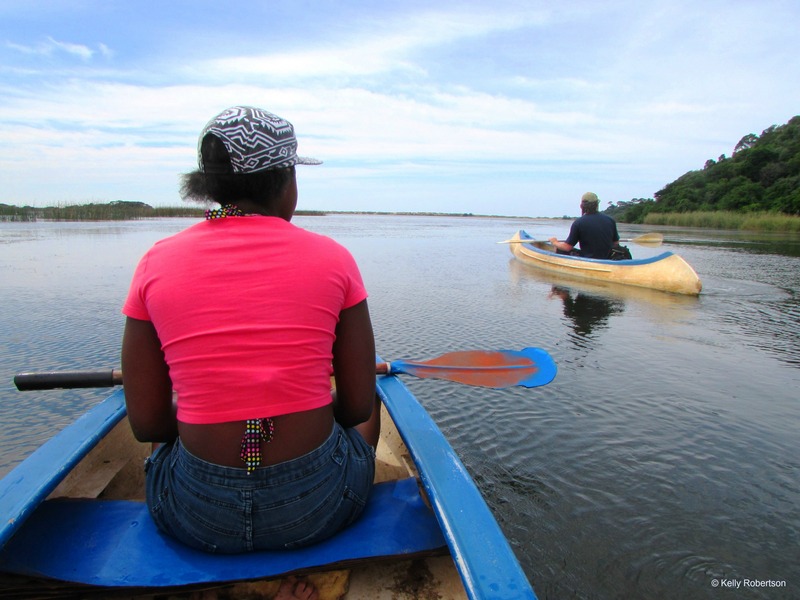 For a fee of R80 per 2-seater canoe we had our mode of self-guided transportation across the river mouth. Violet and I hopped into one while Graham and our picnic lunch backpacks went in another. 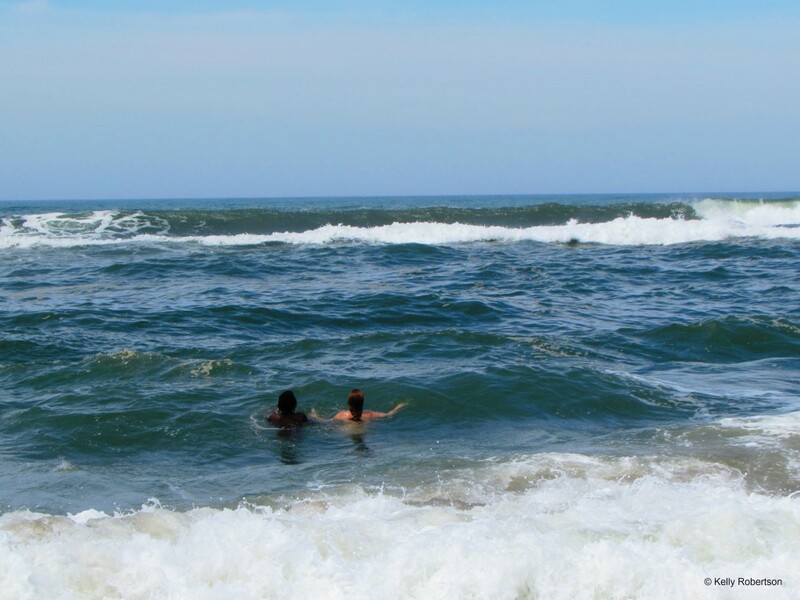 It took us a while to get the hang of paddling in unison and reading the slight current, but amidst giggles we drifted along towards the dunes that hid the ocean from view. It was mesmerizing pulling ourselves through that water and a mini work out too. The herons, fish eagles, jacanas and cormorants went on with their water-based day as we moved through their territory and the fish jumped out the water constantly as if curiously popping out to say hello. The boats are very stable and the distance manageable and enjoyable. It took us about 20 minutes to leisurely paddle from the start to the coast. Once we had parked our canoes on the shore we strolled over the yellow dunes to be met by the mighty Indian Ocean. It was a beautiful beach day- and we had it all to ourselves. 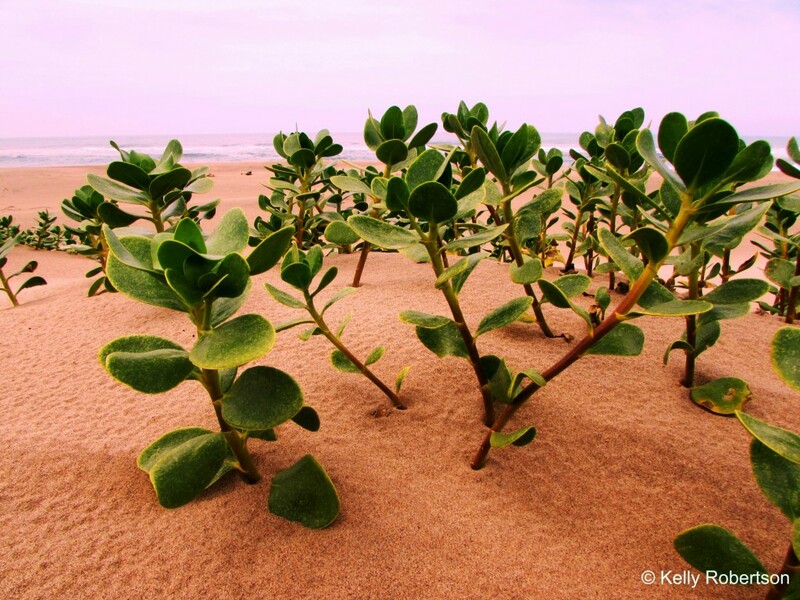 The beaches that fall into the reserve’s boundaries are protected and very secluded. Our favourite types of beaches. We wandered along the sands, finding interesting little footprints, marvelling at the dune vegetation and watching the comical movements of crabs. We eventually chose a good spot to stop at, beside a weathered branch which must have a thousand sea faring tales to tell of its time rocking in the waves. We lunched on simple, delicious picnic food in the best company. As we ate and gazed at the big blue, we spotted a whale in the distance and grappled for the binoculars. This was Violet’s first ever whale sighting and the excitement was immense. Over the next few balmy hours, we swam in the sea which was in the mood to give us just enough wave action to keep us entertained with just the right calmness to keep us in. It was one of the best swims I’ve had in ages. We also combed the beach, finding fascinating shells and other sea ware. It was just perfect. 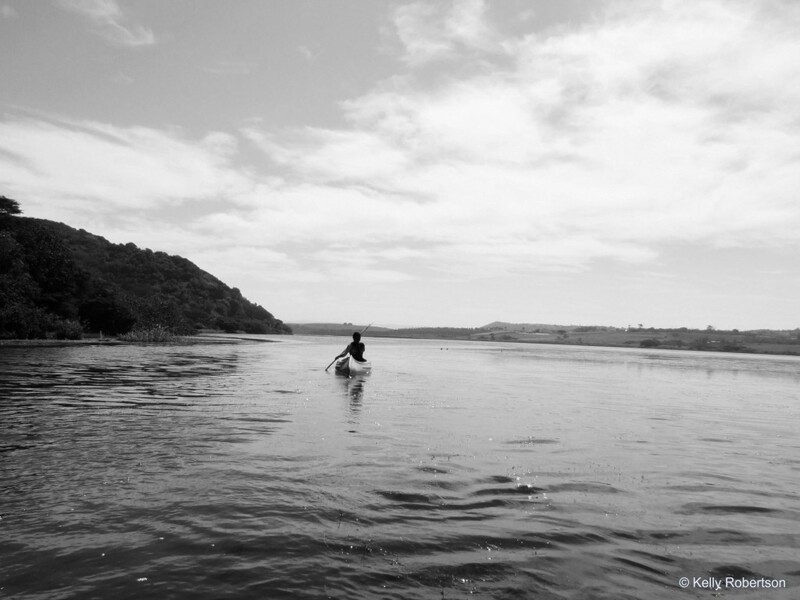 With full tummies and our tingling skin telling us we’d had enough sun and sea salt for one day, we headed back across the estuary in our canoes. 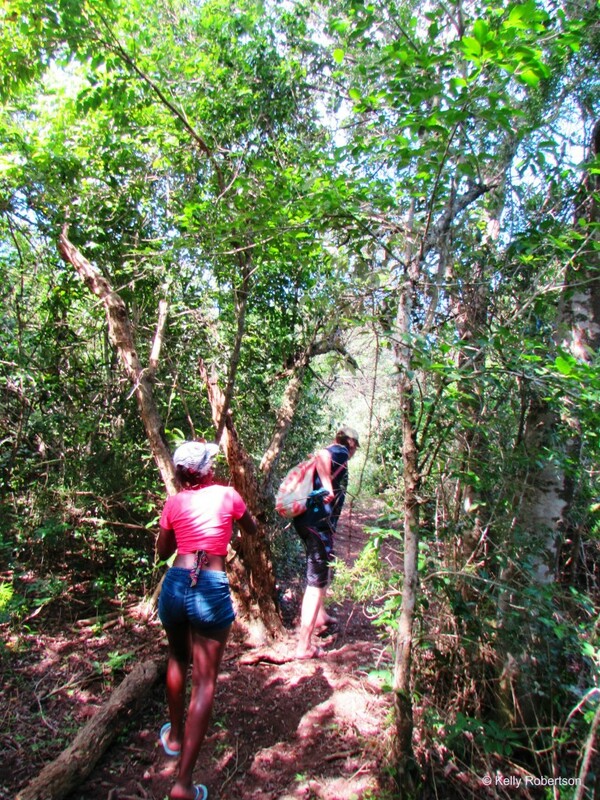 Back on the “bush” side of Amatikulu we chatted to Junior and he recommended we find the sign for trail 3 and 4 and take a walk through the coastal bush. We ambled along the well-marked, grassy path in our slops and smiles. We greeted a herd of zebras along the way who moved off quickly and took in the sights and sounds of a completely different setting to the river and seaside ones we’d experienced earlier. We trekked up steep hills and through dense coastal forest, cursing the heat but loving every moment. We heard a kudu’s alarm call somewhere in the deep green brush but didn’t ever see him and laughed after the initial fright at being zapped by what we think could have been horse-flies stinging us as we passed through their home. We renamed them “electricity flies” after they shocked us with their little stings to our legs. It didn’t really hurt much but made for even more excitement. After walking for a while and feeling the burn, we reached our destination and it was all worth it. We were at the whale watching platform. We climbed the stairs of the wooden structure and oohed and aahed over the stunning views from inside. 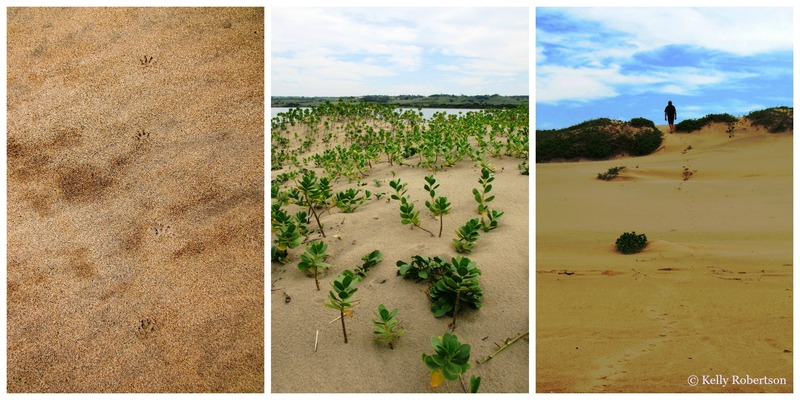 We filled our eyes with the panoramic sights of the ocean, dunes, estuaries and bush- all in one gaze. It was absolutely gorgeous. Amatikulu is a very special reserve indeed. 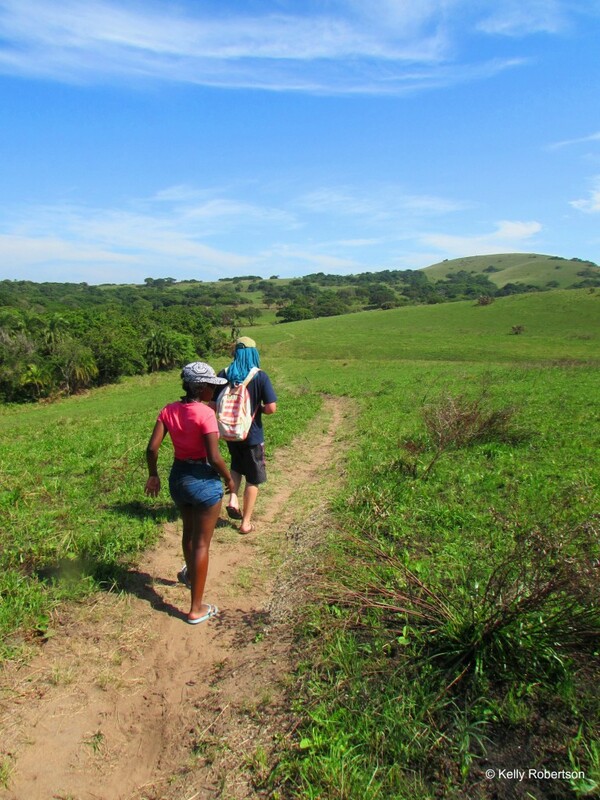 It was a happy, fulfilling day spent out in a gorgeous part of KZN’s natural heart, and a reminder of why experiences and memories are so much more valuable than things. 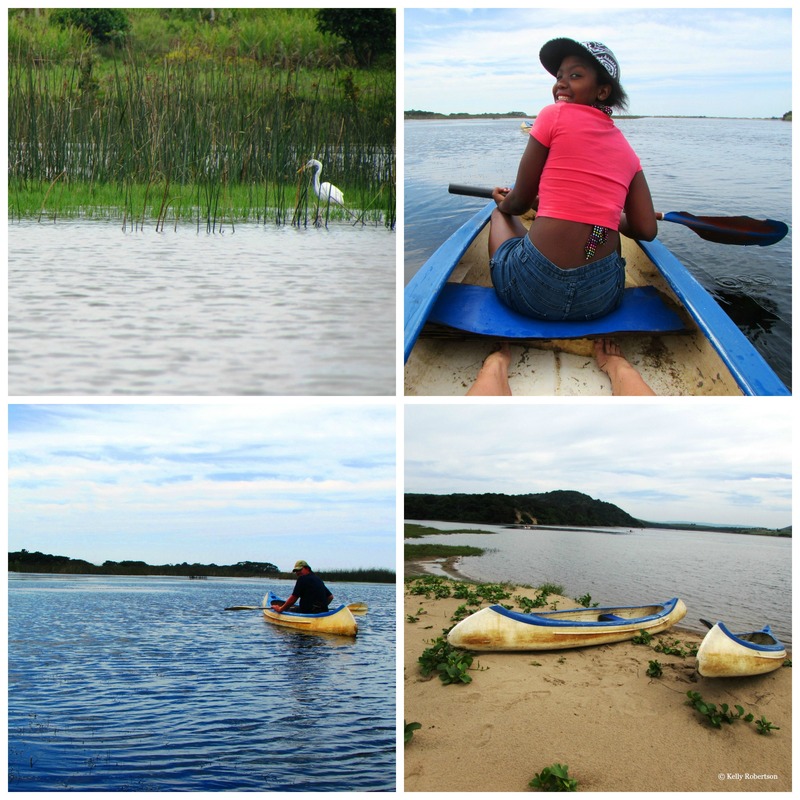 Guided birding walks: Junior Gabela was the guide who rented us the canoes and he also leads birding walks in Amatikulu and other reserves in the KZN area. 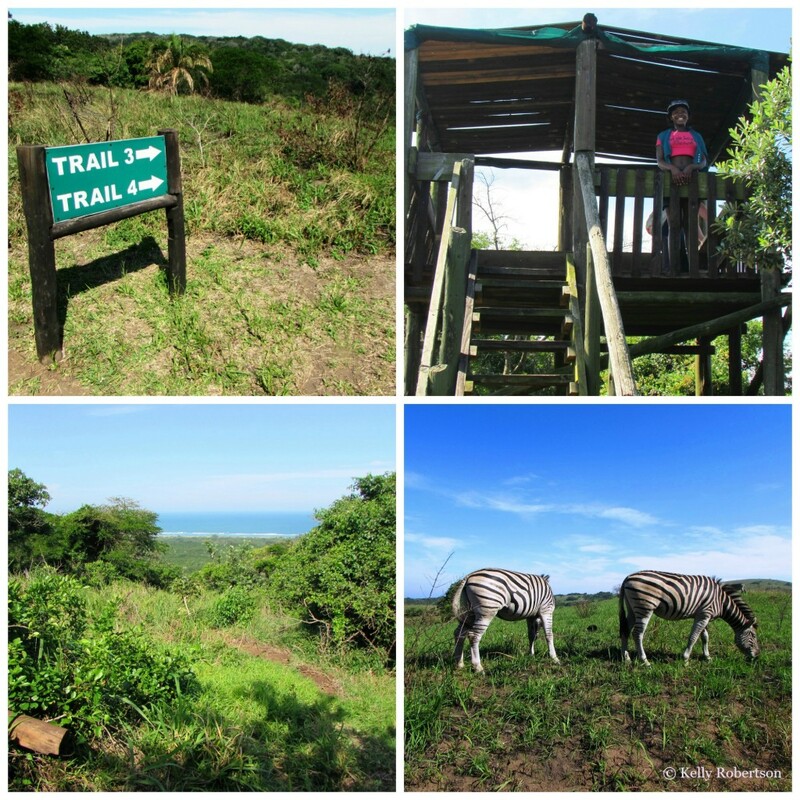 Overnight Accommodation: a tented camp as well as camping is available. 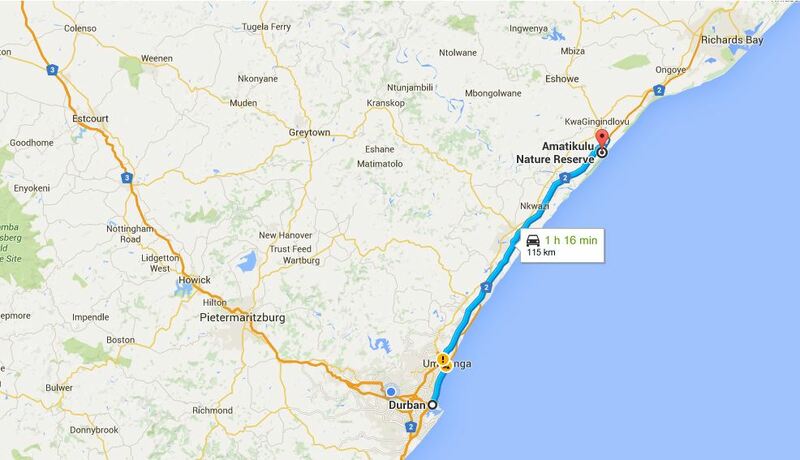 Bookings through KZN Wildlife. Hi BushBaby, this is so beautiful. Glad we have such beautiful and tourists attractive areas. Thank you for sharing this with us. I agree whole heartedly Sandile! Thanks for reading. After reading your amazing review we set off last week Saturday to do just what you did. It had been my husbands birthday and this was the outing that he wanted to do with us as a family. We were all excited and couldn’t wait to go exploring. What a disappointment!!! The road down to the picnic area was horrific, both our girls were very distressed as to how we were going to get back up the hill. When we reached the picnic area we spotted 2 zebra and thought this would make up for our bad road trip down. Alas, we phoned the guide to hire some canoes, but an hour of waiting in the hot sun was no fun and so we decided to leave! A guard had come down but it seemed the key was missing to unlock the container where the canoes were kept, he promised to return but after waiting almost an hour we left! An incredibly disappointing visit, one we’ll never do again or recommend to anyone! Once back at the gate when we asked the guard what happened to our canoes he gave some mumbled response and when we asked for our money back he told us he had written a ticket so couldn’t give it back. This would have been such an awesome day but turned out to be a waste of petrol to get there and entrance fee and a waste of a day! I’m sad to hear your Amatikulu experience was not what it should have been, it certainly was very different to my own. It seems like it was a bad day in the organising department at the reserve that day and nothing was in place as it should have been. I’d like to hear if anyone else has visited recently and has had positive experiences? I’d hate to think the reserve is losing its glow due to lack of management since I last visited. I hope it is still possible to have as amazing an experience there as we did and that the day you visited was the exception and not the new rule. Thanks so much for your comment and feedback.